Regal Metal has an extensive list of equipment and capabilites, which make handling jobs that require tight tolerances and volume production. If you would like a printable copy of our equipment list, visit the literature section of our website. At Regal, we know how important it is to have the correct material on-hand when you need it. 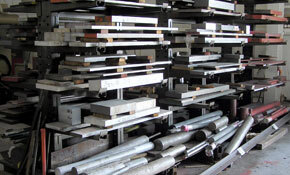 A large inventory is always kept in stock not only for our use, but for other vendors as well. this is important from both a production standpoint as well as ensures less downtime if new tooling is required.